My previous post about largest payment from Google AdSense was on June 2009. I did get larger amount of Google AdSense payment after that but I forgot to post it. Well, here you are. The latest and greatest Google AdSense payment that I received today. 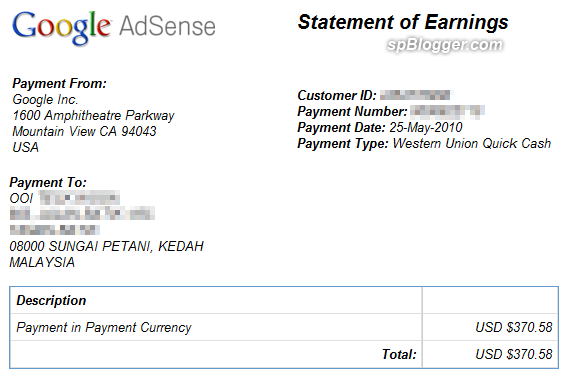 Yeah… I broke RM1000 Google AdSense earning finally. It took me long enough (3 years) to reach that target. The higher USD exchange rate does help. I got 1 USD == RM 3.3213 rate from Public Bank (it should be the same on other Malaysia Banks) which turn to RM1230.80. Finally, I did not have problem to withdraw Google AdSense payment by using Western Union service at Sungai Petani Public Bank. Last few months, the staff refused to process my withdrawal due to miss match on first and last name. Well, the lovely staff that attended me today managed to solve that simple problem. Let say, My IC name is Koay Ah Ka. So my first name is Ah Ka and last name is Koay. So put in the same stuff in the Western Union withdrawal form should do the trick, right? Nope. In the system, my first name is Koay Ah and last name is Ka. And the sender name ~ Google Inc is at the last name column. Anyway, by filling in the exact way as the system shown, I got my money in the end. Do you face this issue when you withdraw Google AdSense using Western Union?